Quite excited when this little tin landed on my doormat. I’d chosen lavender, my choice out of 6 different scents, with the others being citrus, mint, pure, tropical and spice. The lavender is a very subtle fragrance not over powering as I’d feared. The deodorants come in a handy sized tin and contain no parabins or synthetic fragrances. The tin is a perfect size to pop into a handbag or travel bag taking up much less room than a spray. Perfect for travelling, no worrying about leakages or breakages. We saved the deodorant for a trip away in the caravan, just in case we didn’t like it and had easy access to our old faithful deodorants. We both used this deodorant for the duration of the 10 holiday with no need to to even pick up the deodorant of past preferences. On our trip we did an unbelievable amount of walking for us, up to 8 miles a day and returned from every walk smelling as fresh as when we left the caravan. Used sparingly by applying a small amount to the armpit with the finger tips the tin served us both for 10 days with still plenty left in the tin. Back home and 3 weeks after it’s first use I would estimate there is still a week left in the tin. Value for money too. I probably used it a little more liberally than advised. It appears to melt into the skin on contact leaving no visual evidence of the deodorant at all. Perfect for strappy tops in summer. My only negative was having to scrub my hand and nails after applying. With my regular deodorant you just spray and go. Having long nails I had to use a nail brush to make sure there was no residue behind my nails. That being the only negative I think it faired quite well. 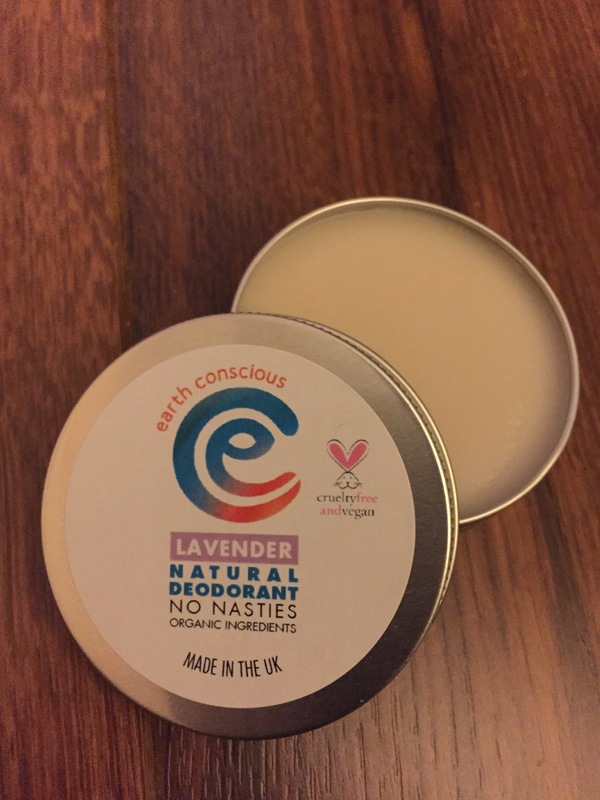 Made in the UK, completely vegan and cruelty free this product claims to contain No Nasties and is completely organic. Founded in 2014 I think these guys may be into something. At a cost of approx £5 per tin for the way it has lasted between us it is very cost effective and friendly to the environment too. Also worth noting that 10p from the sale of each deodorant goes towards the Marine Conservation Society, the UK charity for protection of our seas, shores and wildlife.